I've stopped by the Studio several times in the last month, mostly to check on the progress of things in and around the building. Pretty much nothing happened through the first two months of the year, and then we had the combination of the flat file donation and the flood, both of which contributed to another idle month. But over the last week or so things have started to turn around, and I went there today with the intention of actually doing something. Building management was there today, so I took care of a minor task, getting rid of some old chairs. A few weeks ago I had Brendan mark a few for eventual removal, but they were still there on my last visit. So my first job today was to take them to the back door area (above) where garbage is stored until it is hauled to the outdoor dumpster. Those chairs looked considerably better when I found them at a garage sale, and they still would function as chairs, but the backs have been disintegrating for years, so this seems a good time to get rid of them. One odd thing- there were four, but I could only find three in our room. Maybe his work crew had taken one out already. As I was moving chairs through the halls, I met our new neighbor, a local painter who has taken over our former table shop. The familiar folding plastic tables were in there, but now would be used to help her hold painting classes. I wished her good luck with her plans, as well as surviving the noise from the music/voice studio just above. 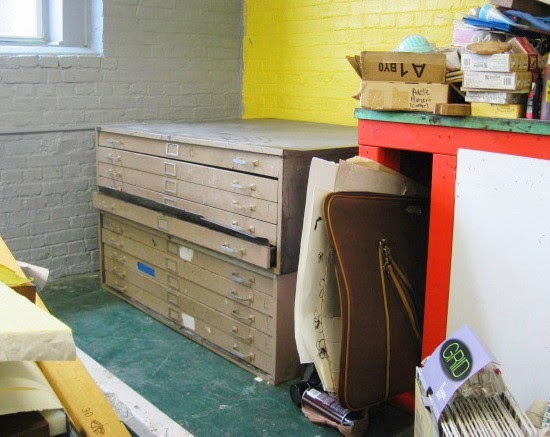 The biggest difference is that the flat file parts are now assembled up on the platform in the corner, and with all the other stuff that had to be thrown away, this is the emptiest this room has been in years. There is still a bunch of clutter on most of the horizontal surfaces, but that just calls for Molly getting some boxes or plastic storage bins and gathering it all up. The one work surface that was relatively easy to use today was my work table, now cleared of the Molly stuff that had been stacked there by the cleaning crew, and my oversized foam core and mat board. I didn't need much of the table top today, just enough to do a little framing. It has been my plan to frame the original print I made for the train show postcard, and make it available as a fund raising prize for the show, such as door prize, or a raffle or something. Since I don't want to spend a lot of money on a donation, I figured I'd just get a cheap frame at a dollar store, but I hadn't liked any I had seen so far. 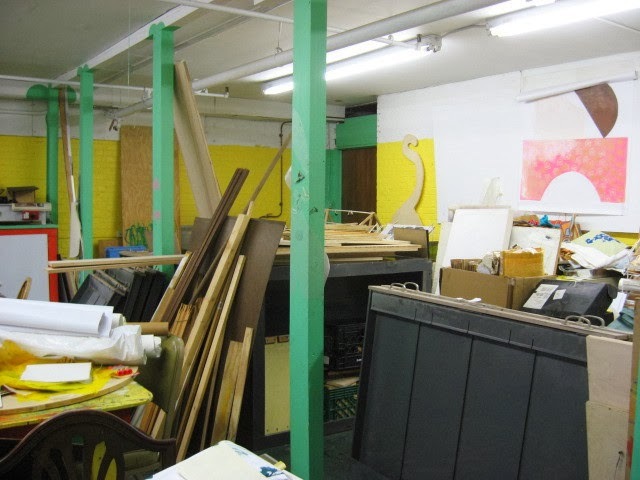 Then some artist was cleaning out his studio and decided to drop off at the Boatworks a whole bunch of frames, framed art, illustration and mat board, etc. It was all put up for grabs, so I grabbed some things I could use for school, and a frame for my train print. I brought that frame and my print to the Studio today to swap it out. I removed the previous "art" (oversized photo printed by Staples and scotch taped to the back of the mat), and mounted my print with linen tape hinges. Unfortunately, I had forgotten to bring my chop mark stamp, so the final assembly will be done later. Week 3 for this current run of woodcut classes at the Boatworks. A slightly different dynamic today, with one of the new people missing, and one of my most experienced students joining us for the last two sessions. Jill decided to just take two weeks, mostly to get a refresher in printing. She went right to the back table, where Mary (missing last week with an injury) joined her. Mary was working on a new version of a previous print, an image involving a porch. One of her New England contacts has invited her to put it in a show of white line prints she's planning for two years from now. And this is just days after mailing out her editioned four block print to an exchange folio at PCNJ. There's a committed printmaker. My other class veteran, Joan, had finished cutting her block since last week and was ready to print, so I set her and Jill up with all the supplies and let them get started, They would each pull decent proofs of two blocks today. Meanwhile, three of the new people were there, all working on cutting to start. I had ordered tools for everyone, but perhaps in the chaos of getting ready to attend this year's SGC, the supplier didn't ship them until this past Wednesday, and so they won't arrive in New Jersey until next week. Luckily I had my tool supply for them, and they all live close enough that we can arrange for them to drop by the Boatworks to pick them up before our last meting. One had found some speedball ink and pulled a proof on her own, and after a few small changes, I helped her pull a better one. The others just continued cutting. Between the three tables I had people cutting, inking, and printing, plus I was tearing paper, and sawing blocks. The two and a half hours can really fly by. Everyone is well trained, so the cleaning was done quickly, just leaving me to finish sorting, packing, and to load the car. We're off next week while some music events are scheduled, and then the last session for this series. Then I'll check the BAC master calendar and see when we can schedule the next woodcut series. Had a quick phone conversation with Molly last night, during which she mentioned having stopped by the Studio just long enough to pick up something, and seeing that the painting of the back wall was completed and the flat files assembled and installed. She couldn't come in today, but I had time to stop by and check out the current state of the room. 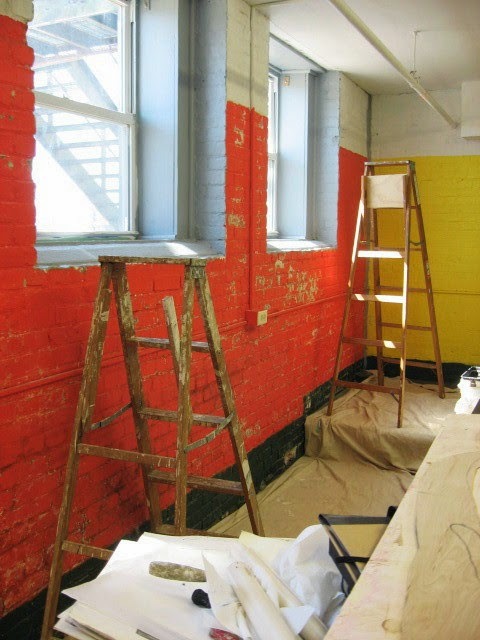 There was now indeed another coat of the gray on the wall, its dullness emphasized by the adjacent examples of the yellow, red, and green from the original paint job. And the files have been put together and put in place. It's easy to see how these came to be in our possession for free. I'm not so much concerned with the beat up exterior appearance, but how well they'll work. That one drawer that is partly open is that way because it can't close- the inner flap that holds down contents won't fold all the way down. The top drawer won't pull out at all, and when I tried another, the handle pulled off in my hand. That still leaves 7 drawers that were functional today, so this thing will definitely be able to be used to hold a lot of stuff. And the large top has potential to either be an additional work surface or some kind of storage. With the flat files now off the floor and up in the corner, and all the other stuff that had been against the back wall now gone, there is a lot more room to maneuver there now. The main work tables and the palette cabinet are still piled wih all kinds of loose clutter, all stuff Molly needs to sort and deal with. My work table is mostly clear, and I can create space on it quickly when I'm ready to work large again. Those chairs that Brendan had talked about getting rid of were all still there, and since he an Herb where getting ready to go home for the day, I decided to put that off until later. I think that sums it up right there. Stopped by today to see progress on our room and was greeted with the ugly gray wall on the back of the room. A more careful look shows that this was just a single coat in spots, leaving hints of the bright red showing through. I don't know if another coat of gray is coming, or if they are leaving it to us to decide what comes next. It certainly needs something. In a rare situation, all four of my print related schools won their first round games and advance to a second day. In another rare situation, after the second round, all four schools were eliminated. Not only that, the sweet 16 doesn't have any schools that I have any other emotional connection with- no traditional art schools, places where friends of mine work, schools in conferences I have some affiliation with, nothing. I'll still keep watching the next few weeks, because there will still be some good basketball played, but I won't be rooting for anyone in particular from this point on. After a one week break, the woodcut class is back on schedule. I had been informed by Mary that she wouldn't be able to make it in today (though she's working on stuff from home), but the other five students were there on time, and I had everything set up and ready for our 2:00 start time. Everyone had gone ahead and completed a block drawing, some even doing two, one on each side of the panel. Some were still working out questions of positive/negative breakdowns, but enough of them seemed ready to proceed that I decided to jump right into the cutting demonstration. 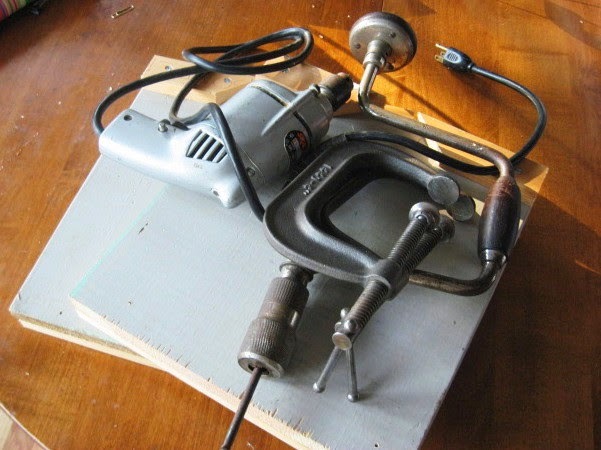 The tools I have acquired for the class are those that I find the most useful, so a few sizes of round gouges, some v gouges for thin straight lines, a chisel and a straight blade. Didn't take long to get through those. 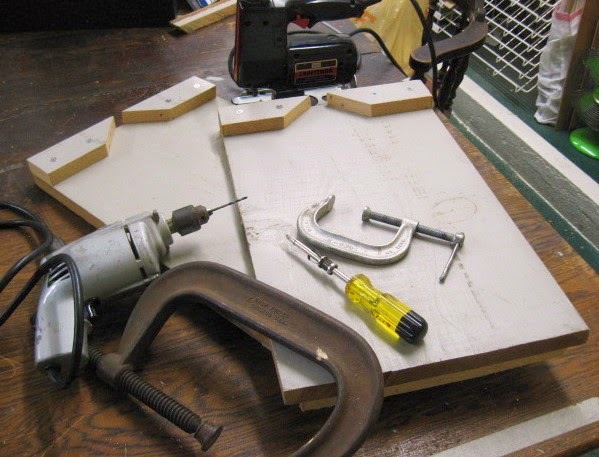 Went over some safety basics as well, and broke out the bench hooks, which everyone found a big help. By the end of this first day of cutting, all the new people decided they wanted to buy tools, so I collected everyone's list, and I'll place the order this week. We worked right up to the end, and everyone seemed excited by what they had going. It was so busy, that once again I didn't get around to pulling out my camera until everyone was gone, so I just got this end of the day shot of my expanded bench hook collection. We will get everyone started with cutting again next week, and maybe a few people will even be ready to pull a first proof. Today I finally finished my week long project to build a couple of bench hooks for my current woodcut class in Belmar. Under normal circumstance I could knock out something like this in a single session, but the Studio is still not ready for normal circumstances. A lot of work has been done in our space, but as of yesterday there still wasn't any work space available on tables, so I took care of the final assembly step on the dining table at my parents' house today. If these tools look familiar, it's because they all got a lot of use in the second half of 2013 in my table building job. But now this task is complete, so I packed them all up and went home. The bench hooks will be made available to my class tomorrow afternoon. 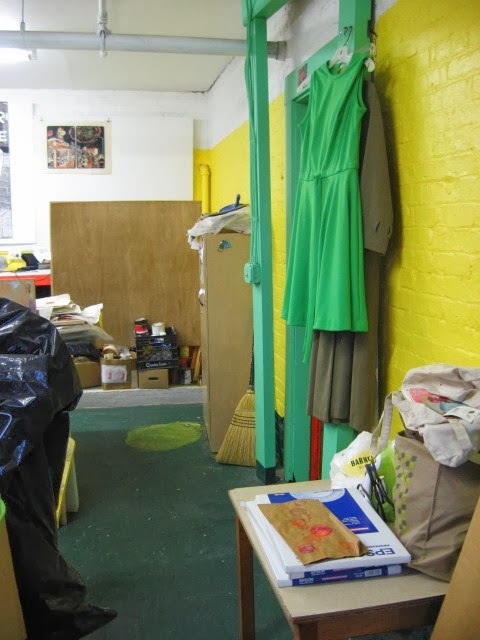 The recent flooding of the Studio did not cause a lot of permanent physical damage, but the contamination did force the disposing of a lot of accumulated stuff. And that seemed a good incentive to get rid of some more stuff that was untouched by what backed up from Neptune's drains. And as long as all that was going on, the building thought it would be good to do some needed repairs and repainting. Molly left me a voice mail this morning saying that the management was suggesting getting rid of all our chairs, so I figured I better get up there and make sure nothing disappeared. 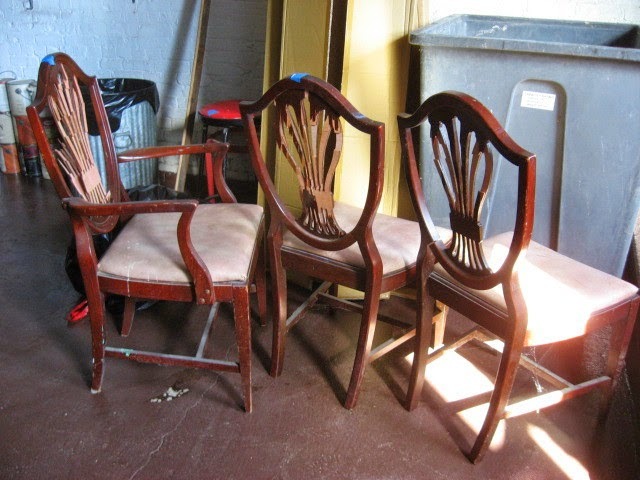 As it turned out, Brendan was just talking about a set of four dining room type chairs we had, the backs of which had been disintegrating almost since I picked them up at a garage sale in our first year there. So we marked those for disposal, but I told him to keep the others for now, including my ancient Czechoslovakian wooden desk chair, with me since Carbondale. 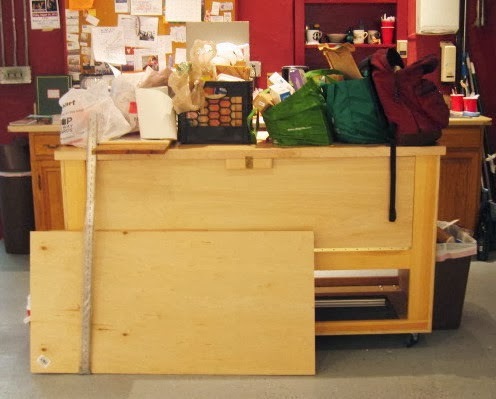 The falling apart cabinet and shelf unit (a donation secured by Molly and arrived in the space before I built any of our furniture) has been removed and thrown away, which will make room for the flat file units. That back red wall hasn't been this visible in this decade, with all the stuff Molly had been keeping there now gone. Last week building crews were at that wall, scraping back dozens of calcium deposits that had been secreted by the ancient brick walls. 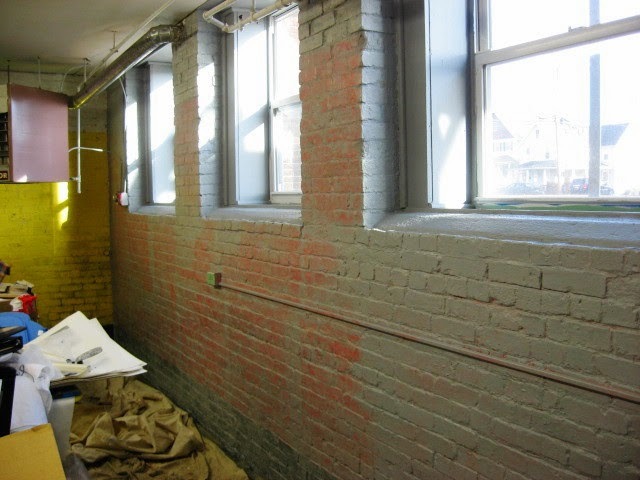 Since my last visit, the crew had also repainted the window sills with gray paint (done in bright green paint more typical of our space just a few years ago), which they started to use in some of the room corners as well. I don't know if they plan to also use it on all the scraped areas, or even to just repaint that whole wall. That gray is pretty depressing, so depending on how much of the wall it covers, we may decide to paint over it again. 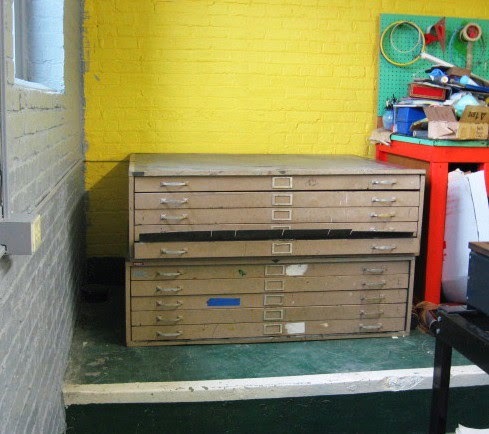 Once the painting is done we can work on setting up the flat files in that corner and start getting the space back. Today is a special day in Studio history, the 10th anniversary of when Molly and I met at showing of work from the Outlaw Printmakers in NYC as part of the Southern Graphics Conference going on at Rutgers that year. I told that story on the 8th Anniversary two years ago if you haven't heard it or want a reminder. A lot of art stuff has happened to me since then, especially after we moved into the Ocean Grove space about 8 years ago. Things have been kind of chaotic there of late, especially with that slight sewage flood a few weeks ago, and furniture coming in and out, so the place will look quite different when we get it back into shape. I'll be very excited to get back into the routine of making prints. You'll find all of that here when there's something to show. This time of year there are two things you can count on with this blog. One is acknowledging St Joseph's Day, which I did yesterday, and the second is noting which colleges I have art links to are playing in this year's NCAA Men's Basketball Tournament. This year four such schools made the field. In seed order- #2 Villanova (showed two prints in a group show there), #3 Syracuse (three prints in a group show), #7 Texas (group folio I was part of exhibited there), and #12 Harvard (purchased one of my prints for their museum). Hard to predict where they'll end up, but I'll post updates on those schools after each weekend is over. Right now we are passing through the spring break time of the semester. Had my week off from one college last week, and the other school will be off next week. And my Belmar woodcut class had off last weekend as well, but that's not so much about college schedules as the complications of finding open spots in the schedule of a very busy building. We'll be back to class this coming weekend, which means I have some homework to finish. I have six students, mostly new, and last time everyone took home a piece of wood to draw on. They mostly decided to go with relatively small pieces, about 6 inches square. 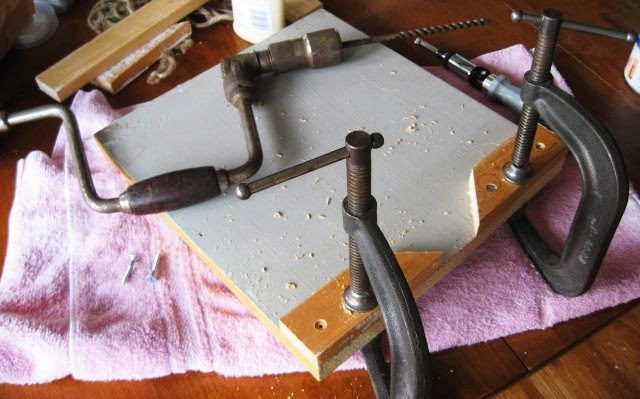 Although I never use one myself, many woodcutters like using a bench hook while cutting their blocks, especially small blocks. 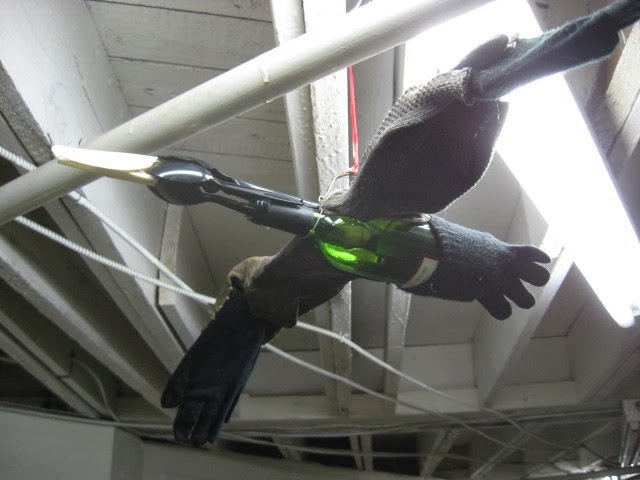 It can be used to hold the block in place, which frees both hands for controlling the tool, and takes away the need to use a hand to hold it in place, a hand that can be in a dangerous place for those new to tools. I made two of them when I first taught the class, and two larger ones (shown above) in 2012. Some students find them so useful that they have made their own to use at home. I still have my four, but the two larger ones may be a little too large to work with these small blocks everyone took home, so I decided to make a couple of short ones before everyone is cutting in class next week. Nothing about the process is difficult, but it's been stretching out over the week around my busy schedule. The two new ones will use the same kind of base as the ones above, an old board from my grandfather's basement supply (one that had been stored above the flood zone), painted with some kind of gray primer many many years ago. Picked it up while at my parents' house a few days ago and threw it in the back of my car. Yesterday, when my class was over and I had this large woodshop classroom to myself, I cut the board to make two small bases. (Even though the room was filled with all kinds of power saws, they're all hooked to a master switch behind a locked door, so I brought in my trusty saber saw from the car. Took advantage of the nice big work tables to work on and all the brooms and dustpans to clean up). Step three came today. Stopped in Belmar to take care of some business, and walked a few blocks to the hardware store to pick up some screws. 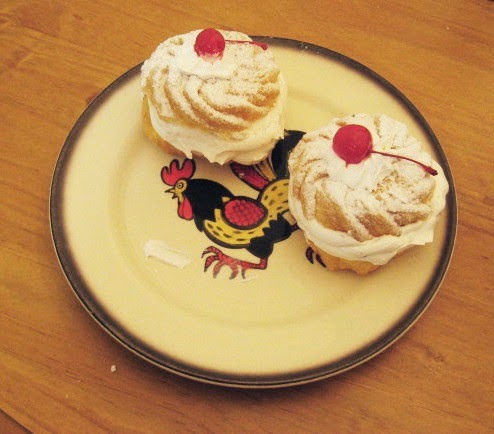 (I may have had some the right size, but with everything piled up in the Studio post flood, it may be a while before I find them) While still on foot I investigated two possible sources for a St Joseph's Day zeppole, but one place was sold out, and the other didn't know what I was talking about. Then drove up to the Studio. Didn't have the camera with me today, but a lot of work had been done since last week. The old wood cabinet had been removed and disposed of, clearing eventual space for the flat files, but getting them in place will wait until some repainting is done along that back wall. A lot of old stuff that Molly had along that back wall was gone too. Also missing was a large box of mine that contained oversized pieces of mat board and foam core, to be used for someday framing the full size version of my smoking print. Herb claimed that Molly had told him it was garbage, but luckily he thought they were too good to throw away and stashed them away. A little dog eared in the corners, but still salvageable for my purpose. Still not a lot of room to work in there, but I did bring out the mitre saw that got a lot of use in the table project, and used it to cut up some of my old stretcher bars into the pieces that will be the hooks in the bench hooks, half with mitre angles, half just straight pieces, so the units will have both options. Also managed to locate my drills and clamps under the stuff piled on my table. No work surfaces are yet available within reach of an outlet, and the extensions cords are either hidden or were disposed, so the next step will have to wait for a few days. Anyway, you're probably tired of hearing about bench hooks and want me to get back to the holiday food. By the time I got back from the Studio, all the regular bakeries would be closed, so I stopped at the supermarket across the street from my apartment before going home. I knew they sometimes carried them, and I was in luck- a bakery worker was just putting out some packaged freshly filled pastries. Studio Arrabbiata likes to maintain the holiday tradition. At home I made dinner, a big plate of perciatelli with a bolognese style sauce (family recipe, directly from the old country), and in the evening enjoyed one of my treats (sold only as a twin pack) for dessert. This afternoon was as nice as you could expect from a day in March, especially this winter so far. For the second month in a row we had postponed our regular critique because of snow on the original day, but that was long melted. Took care of errands in the afternoon, then drove up to the Studio, hoping to catch the management still there to ask more about the flood. They were already gone, so I took a quick walk across the road to get a slice for dinner, and grabbed a free copy of the Tri-City News from the rack in the pizzeria on my way out. Still not sure how safe the Studio is right now, so I ate in the basement cafeteria while looking through the paper. Tucked it under my arm while I grabbed more stuff from the car and almost lost my grip on it. Refolded the tabloid to put it back together and realized I had just seen some of my art. 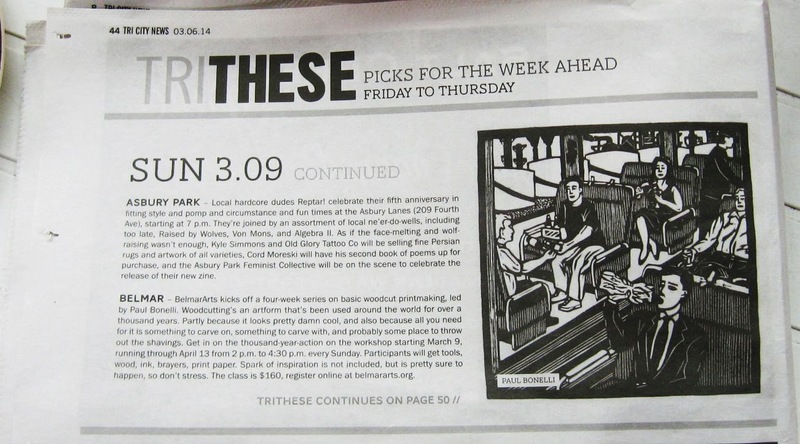 In their picks for the week ahead (issue published March 6th) my Belmar woodcut class got a nice write up. The column's writer, Hannah Walker. credits woodcut as being an artform with a thousand year history "partly because it looks pretty damn cool". Well I'm not going to argue with that. (clicking on the photo should enlarge it enough to read the actual article) The print is one of my older train pieces, last seen in last year's Art on the Edge, and it even got credited to me, not a given with that paper. Since our regular space is not fit for gathering at the moment, we had been giving the building's blessing to use the cafeteria, which we have occasionally used in the past. However I did have to venture into our room to grab the portable tack board, which luckily is kept up on one of those concrete ledges. Complicating matters was that our hallway was filled with a decorated arch, a table with rolled up programs, colorful tablecloths, people dressed in formal clothes- looked like a wedding was going to be held outside our Studio door, and that turned out to be the case. Might have blocked access to our second door as well, so another benefit of the critique being relocated for the night. Got the tack board and got out of there before things started up. 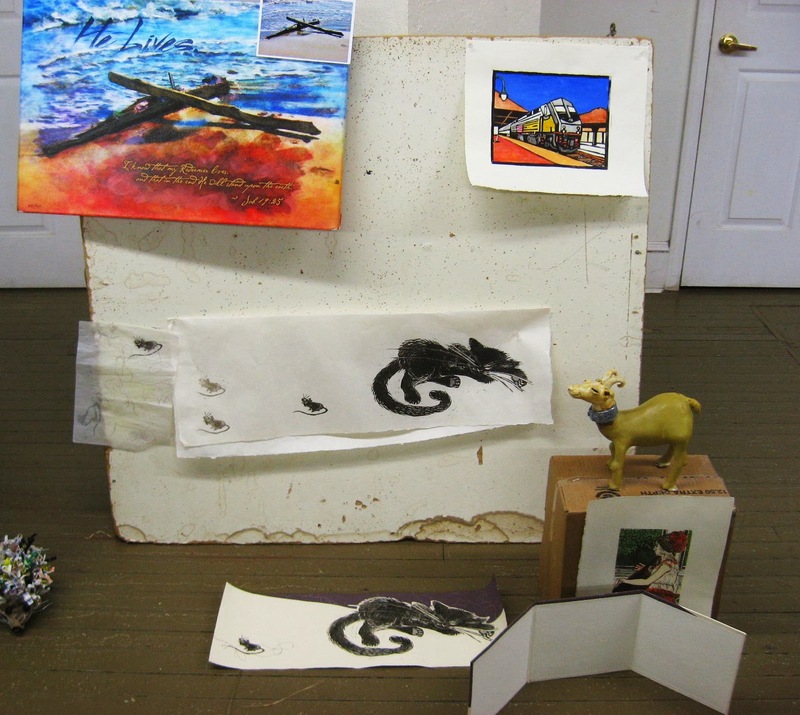 As for the critique itself, we had 6 participants, all bringing art. In the above photo, top row is a mixed media digital painting from Mary's daughter (I think her name is Katie, but I'll have to check on that), and my full color first version of my postcard print, underneath that some of Molly's cat and mouse linocuts in various states, Margery's ceramic goat, and a four color print from Mary's recent group folio edition (finished version of the one we saw last month). 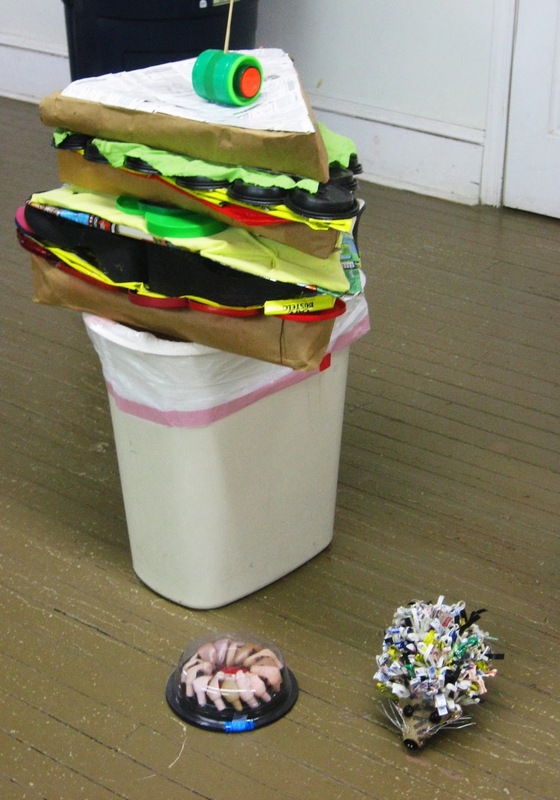 Besides loaning me a couple of older pieces to demonstrate for my 3D class, Lisa brought in four sculptures. Above, another large sandwich to follow up her hoagie in Belmar, a hedgehog and a shrimp ring. Below, a goose hangs from the rafters above the cafeteria. With only six artists and not going too far beyond the timer, we actually finished on time. The wedding crowd had started breaking up, so we were able to get the tack board back in there easily (Molly's first look at the Studio since the flood). She expressed a hope that in April we will finally get back to our first Monday regular schedule. It's all up to the weather. Of the six in the current group, two have been in this class before- my most loyal student Mary, and BAC regular Joan who took it around this time last year. The others have a variety of woodcutting experience, but nothing recent, if at all. We opened with the usual artist introductions and review of the plan for the series. 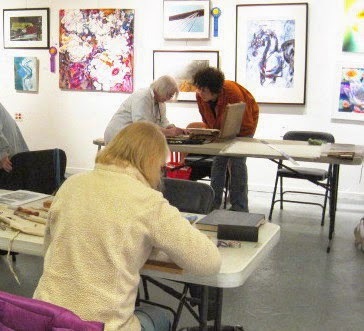 I showed a variety of my work and some group folios with many different examples of prints, styles, and subjects. I had brought with me a full panel of lauan that I had from last year, but I decided to cut up the piece of 1/2" birch I bought recently. The pieces were small for their first attempts, and I have plenty more to make bigger ones if they want those before we are done with this series. Everyone seems excited by the possibilities. The Boatworks was already reserved for next Sunday, so they have two weeks to work on a block sketch, and we'll continue after that. 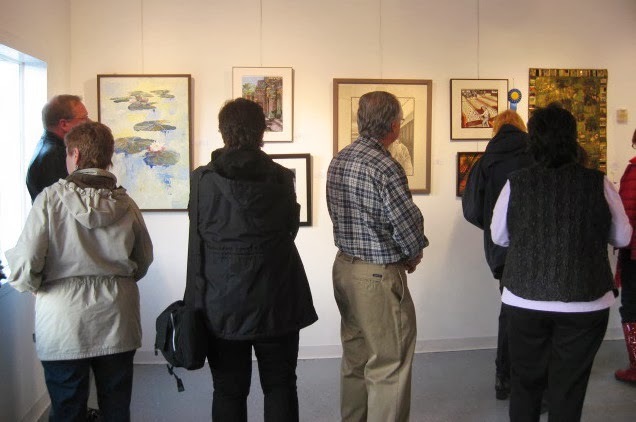 Tonight we had the opening for the Belmar Arts Council's 10th Annual Jersey Shore Juried Art Show. The Boatworks has been spruced up and all 3 rooms were put to use to hold the 82 piece show. This is traditionally their biggest show of the year, in terms of both entries and attendance. That's holding up for this year so far. I got there extra early, both to make sure I got good parking and because my brother's family was showing up early with the little kids before the crowd arrived. And it did arrive. We are estimating about 300 people came through over the length of the two hour reception. We were blessed with one of the nicest days so far in 2014, allowing us to keep the doors propped open for air without making the visitors suffer freezing temperatures. I already knew about my prize, but this time the ribbons are now up. My two pieces can been seen in these two photos- the bowling print (with blue ribbon) over the shoulders of the crowd in the photo above, and my Blake print in the photo below. The prize envelope made the decision to end the annual winners show official, but contained a nice check. Received congratulations on the award from people all throughout the reception, and the juror, Margaret O'Reilly from the State Museum in Trenton, introduced herself. 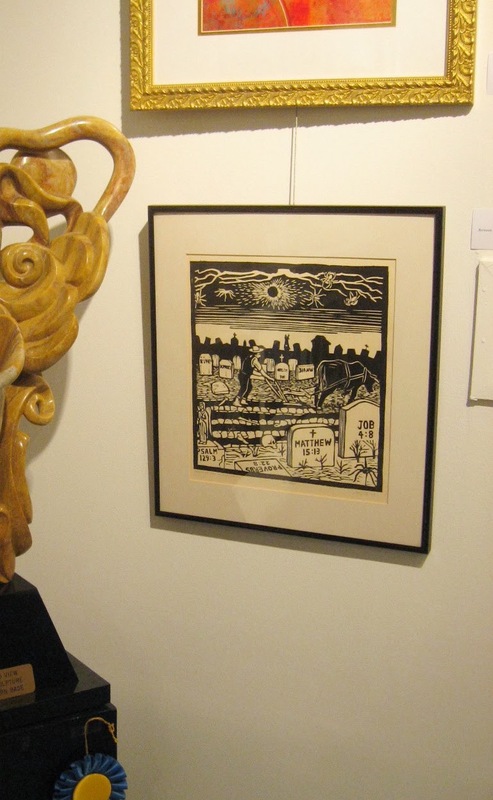 She said she was very excited to see woodcuts in the show's entries, as she's a fan of the medium in general and they aren't that common, and in my case appreciated the bits of humor she detected. Mine were the only two woodcuts of course, and the only two traditional prints. There were two traditional drawings (pencil and charcoal) that would have been in my category, and even if some digital pieces were thrown in to my graphic media category (it's up to the juror to decide that I guess), still not many competing for that prize. Almost half the accepted work was photography, noted by many without much enthusiasm. My response was to point out that the juror could only select from what was submitted, and considering how many digital photography classes are run there, not to mention that this show was judged only from digital images (all they had to do was send files they already had as opposed to having to properly photograph paintings, sculptures, etc), it's not surprising to see so many. I spent more of the reception talking to people about two upcoming BAC related projects more than the prints I was showing. My woodcut class starts tomorrow, adding a sixth member tonight, a veteran of the class from last year. And then there's the train show, which I didn't start, but I'm chairing the show at their request, which makes me more involved than anyone. The official 8 foot banners are still in production (printed on canvas or something similarly durable), one of which will be displayed at the train station, so while my mural idea wasn't chosen, I will have a big artwork there for a little while this spring. We had a homemade oversize computer printed version (maybe 4 feet long) in the window and the postcards out for people to pick up, and response to the design I made has been very positive. I was satisfied with the result, but it's just adapting a straight photo I took to the modern simplified style and bold colors of early 20th century train posters. The two prints I have in the show involved a whole lot more creativity and hard work in both conception and completion. 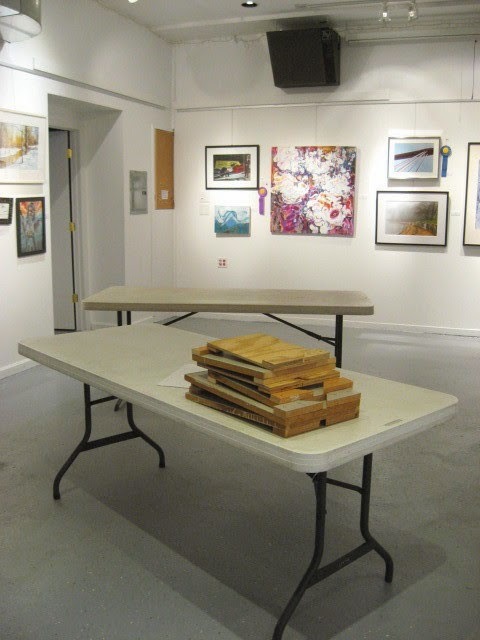 This juried show remains on display through April 11th during regular gallery hours (Wed-Sat, 1 to 5). More photos of the opening and works in it can be seen over on the BAC blog. I dropped by the Studio yesterday afternoon to leave this month's rent check and see the state of the room. Molly had acquired a large double set of flat files and they had been dropped off (disassembled) in there about a week ago, completely blocking access to my storage cabinet and my work table. I called her to express my dissatisfaction with the state of the room, which she claimed to have not actually seen yet. The flat files are a good thing, and I offered to meet up there soon and help her move furniture and get rid of junk so we could get it set up and get the room back to functioning. Between the long running table project, the busy end of the semester and holidays, and then the never ending snowstorm that has been 2014, I haven't been able to get much art done lately (my Christmas card and train postcard were done at home), but I'd love to get back to work. A few days later she called to say that she had moved the flat file parts enough to give me access to my stuff and she'd work on picking a day for us to do some heavy work. So when I arrived yesterday and saw the current state of the room, I was actually happy. Sure, these photos look like a disaster, but I could see that considerable stuff (hers) had been removed from the room. The photo below shows a lot of empty floor and wall space that hasn't been that empty in years. Still a huge mess, but it looked like she had made a lot of progress since last week. One odd thing- the lights had been left on inside the locked room, and when I was leaving I found out why- they couldn't be turned off. The room has two switches, one by each door, and neither one had an effect on the lights in the room, though one was turning off the hallway light right outside the door we use most often. So I locked up and went upstairs to ask about it. As soon as Brendan saw me he assumed I was there to ask about the flood, which he assumed Molly had told me about. What? It seems that there was a problem with one of the sewer lines on route 71 in Neptune, and several days ago it started backing up into the building, through these odd floor drains in the room. Not a deep flood, but the stuff had spread over parts of the floor, under the door, and into the hallway. The pipe problem had been resolved, and the building used all the workers they had access to to do a lot of cleaning to an extent that I didn't realize what had been there. So a lot of the stuff that had been removed was not so much Molly sorting her piles of art and materials, as it was disposing of flood damaged items that had been piled up on the floor, under tables, under the press, leaning against walls, etc. I know she had a massive pile of old prints and drawings under the press, stuff going back to grad school. I certainly know what it's like to have a sewage flood destroy large amounts of old work. I have well documented on this blog the effect of Hurricane Sandy on my own back work. Back then, sewage flooded the basement I had a lot of my older work stored in, two feet deep, and though I had nothing on the floor, prints and blocks on lower shelves were completely ruined. It's kind of surprising that this hadn't happened at the Studio before, since we had major hurricanes in the region in 2011 and 2012. No problems anywhere in the building, much less those floor drains. Still, as a precaution, each time I had made sure I had nothing of value on the floor, with all my blocks and prints on shelves built on top of the inconvenient but now fortuitous concrete platforms around the room, or on top of tall furniture, and they were still there right now. So this disaster I lost nothing of mine, but I can relate to what Molly will be dealing with. I'm hoping next week we can find a time to get back to the task of getting the room in order to get back to printmaking. Aas for those lights, they were aware of the situation. The person they had doing electric work had decided on a creative solution to rewiring some of the circuits in the basement. I'm told someone will be coming in next week to try to sort it out. A few weeks ago I wrote about having two pieces accepted into this year's Annual Jersey Shore Juried art show in Belmar, providing the stories behind each. Today the prize winners for the show were published in a press release, and it was announced that my print Tenpins the Old Fashioned Way won the award for the category of Graphic Media and Drawing. This is the second time that I have won an award in this annual show for a piece that had rejected in an earlier year, which can happen when there's a different juror every year. I haven't yet seen the show, so I don't know how much competition I had, if any, so for now I just get to enjoy the victory. Before this announcement I had heard that the BAC has decided to end the tradition of the winners of this annual show getting a special show of their own the following year, so I guess I won't be participating in my third such winners show. I'm told it's a mixture of the amount of work required to put ir together, the relatively poor attendance over the run (only 6 artists and whoever they can invite) and the lack of income (no entry fees). The decision is a little disappointing. Not because I was hoping to have another big show (I'm really running out of stuff I haven't yet shown in the building), but because this show was a legacy of mine (a suggestion I made in time for the 3rd Annual show in 2007), and because viewing large samples of several artists work can be one a more satisfying experience. Anyway, in honor of this new award for this not so new print, I decided to dig up and post a photograph that was one of the inspirations for this print. 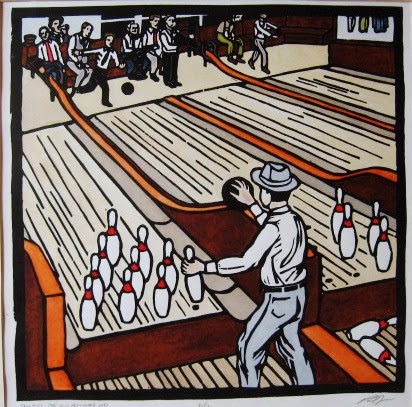 As I stated last time, the start was the invitation to produce a print with a "10" theme, which got me thinking of bowling and how to compose the image to emphasize the pins, normally far away from the bowler's perspective. 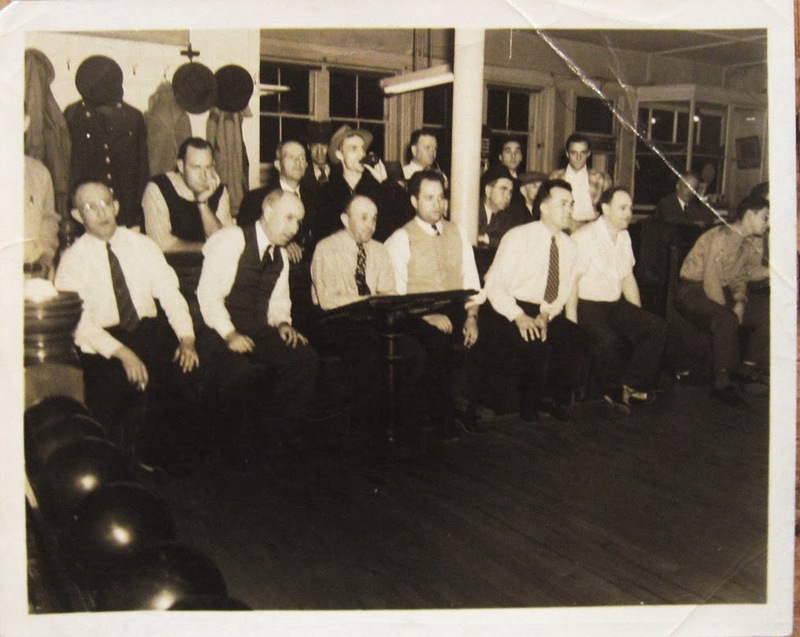 But then I remembered I had found the above photo of my grandfather's in the basement, taken in a long ago bowling alley in Manasquan, one pre-dating pin setting machines. How long ago? No date is listed but the bowlers are all wearing ties, and the photographer's information stamped on the back includes his three digit phone number. These spectators and architectural elements were the source for the upper part of the image. The rest was derived from other vintage bowling references and some artistic guesswork. A long day today. Up before the sun so I could get ready for work. Luckily I had dug my car out of the latest snow yesterday so I could get on my way quickly. Took care of a bunch of errands when I got home late. 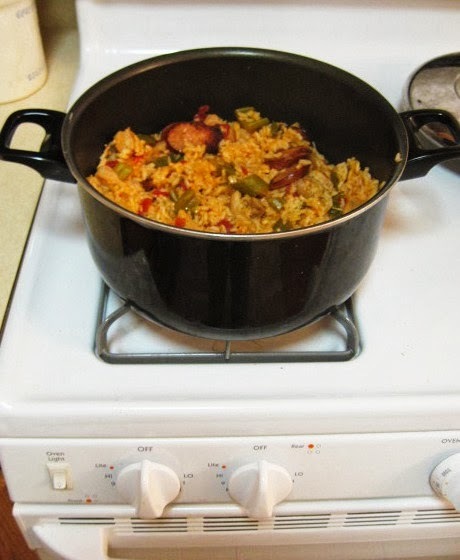 But then I could enjoy Mardi Gras the way I do- finishing the batch of jambalaya I made the other day, accompanied by a cold beer and some zydeco. (chose a Beau Jocque disc from my music shelf) And for dessert, a nice donut I had left over from the other day, purchased just before that snow arrived. Can't enjoy all that stuff tomorrow (except the music I suppose) so I got it in now. 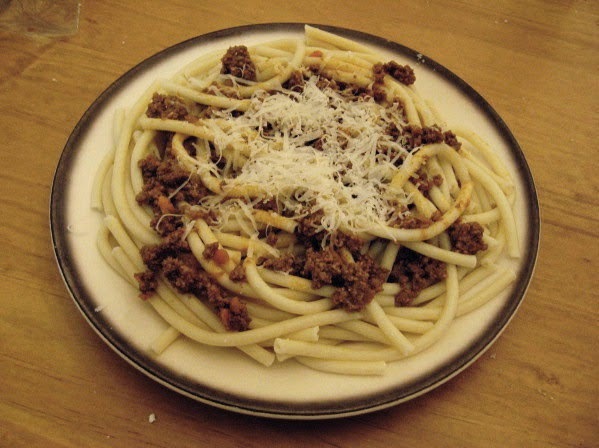 Nothing to do with art, but acknowledging the day is a Studio Arrabbiata tradition.